Sides in Plywood, Particle Board, MDF. Painted, Laminated, UV Clear Coated. Grooves, Dados for bottoms included or excluded as option. 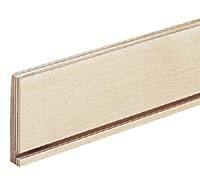 Prefinished Drawer Sides save you time and money with the convenience of pre-dadoed blanks that you can cut to length for your specific project. We offer stock in large quantities of 1/2" and 3/4" by 3-1/2" through 10" Width by 12" ~ 8' Lengths. We offer competitive pricing and provide free estimates:Click here to email us your request.